Bauxite is referred to industrially utilized mineral ore which mainly composed of gibbsite,boehmite or diaspore. Its applications include metal and nonmetal.In the field of metal,bauxite is the best material for the production of aluminum which is the most important application areas.It accounts for over 90% of the world's bauxite production;In non-metallic aspects, bauxite is mainly used as raw materials of refractory,abrasive materials, chemical products and high alumina cement. 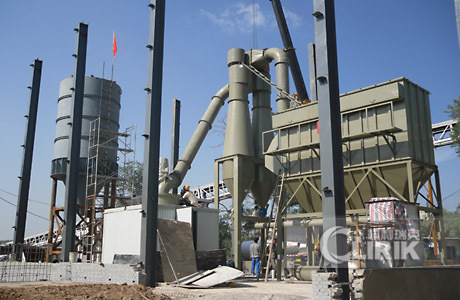 In the development and utilization of bauxite resources,grinding milling equipment is indispensable. Crusher can crush chunks of bauxite ore to less than 30mm of small particles and then transport it to the mill for fine grinding and processing, sub-elect desired fineness, finally used in various production of industrial department. Clirik HGM series three-ring medium speed micro powder grinding mill is designed and manufactured by shanghai clirik machinery is the new type grinding equipment specializing in producing fine and superfine powder of non-inflammable, non-explosive and brittle materials with Mohs’ hardness under six, such as calcite, chalk, limestone, dolomite, kaolin, bentonite, talc, mica, magnesite, illite, pyrophyllite and vermiculite, sepiolite, attapulgite, rectorite, diatomite, barite, gypsum, alunite, graphite, fluorite, rock phosphate, kalium ore, pumice, etc., totally more than 100 kinds of materials. This equipment has passed the CE and ISO certification and won several national patents and scientific and technological progress awards.Clirik not only provides stone crushers and grinding mills with best price, but also installation and maintenance service.